There are 96 Assisted Living Facilities in the Berkeley area, with 2 in Berkeley and 94 nearby. The average cost of assisted living in Berkeley is $3,000 per month. This is lower than the national median of $3,346. To help you with your search, browse the 303 reviews below for assisted living facilities in Berkeley. Better rated regions include Albany with an average rating of 3.7 out of 5 stars. Caring.com has helped thousands of families find high-quality senior care. To speak with one of our Family Advisors about assisted living options and costs in Berkeley, call (855) 863-8283. Berkeley, California, located in northern Alameda County, is best known as the home of the University of California at Berkeley. Yet, it also boasts over 100 acres of parkland and 130 arts and cultural organizations, giving seniors plenty to do outside of their assisted living communities. There are two assisted living facilities in Berkeley and a further 59 in the surrounding area, including San Pablo, Oakland and Walnut Creek. The California Department of Aging administers programs that service residents in long-term care facilities in the state. In addition, the California Department of Social Services regulates Residential Care Facilities for the Elderly (RCFEs). The Berkeley area is home to world-class medical facilities, including Alta Bates Summit Medical Center, in the event of medical emergencies or illness. The weather in Berkeley is beautiful year round. Summer temperatures average 73 degrees and in January the average is 43. In most years Berkeley doesn't receive any snow, meaning senior can enjoy the outdoors throughout the year. Berkeley is a member of the AARP Network of Age-Friendly Communities, meaning that its elected leadership “has made the commitment to actively work toward making their town, city or county a great place for people of all ages,” according to AARP. California does not tax income from Social Security. However, income from pensions and retirement accounts is subject to income tax. California also has some of the highest sales tax in the United States. The cost of living in Berkeley is very high compared to the rest of the United States, with groceries, transport and health care more expensive than the rest of the country. It does remain more affordable than nearby San Francisco for seniors looking to stay in the Bay area. Although the violent crime rate in Berkeley is only slightly above the U.S. average, the property crime rate is significantly higher than the rate in California and the San Francisco-Oakland area. Property crime involves events like theft and arson where there is no force or threat of force against the victim. Assisted Living costs in Berkeley start around $3,000 per month on average, while the nationwide average cost of assisted living is $4,000 per month, according to the latest figures from Genworth’s Cost of Care Survey. It’s important to note that assisted living rates in Berkeley and the surrounding suburbs can vary widely based on factors such as location, the level of care needed, apartment size and the types of amenities offered at each community. 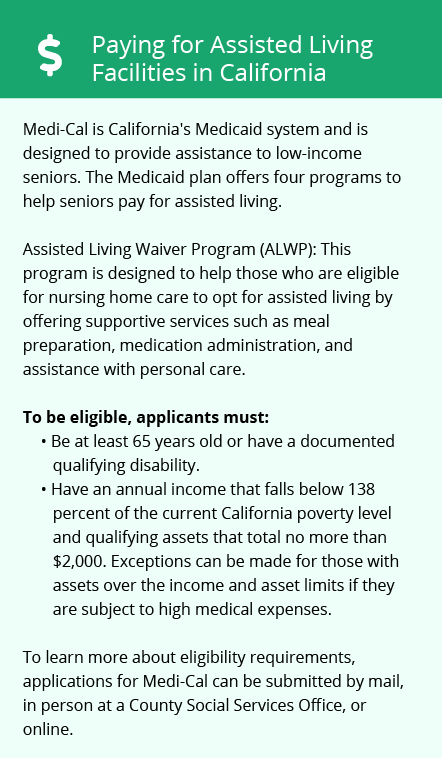 The Assisted Living Waiver (ALW) is available to eligible seniors who enter assisted living in Berkeley. 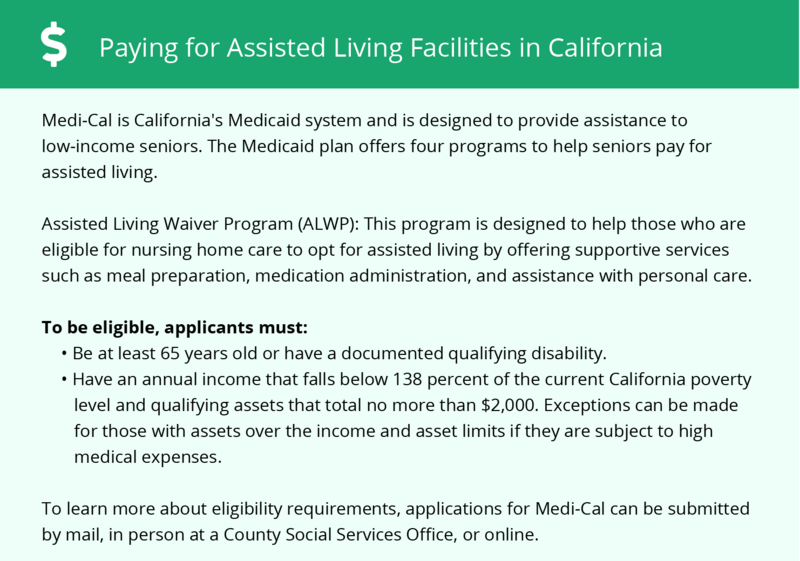 Those receiving the waiver must meet all the eligibility requirements, including being eligible for full-scope Medi-Cal and having care needs equal to those of Medi-Cal funded residents in nursing homes. Berkeley and the surrounding area are home to numerous government agencies and non-profit organizations offering help for seniors searching for or currently residing in an assisted living community. These organizations can also provide assistance in a number of other eldercare services such as geriatric care management, elder law advice, estate planning, finding home care and health and wellness programs. To see a list of free assisted living resources in Berkeley, please visit our Assisted Living in California page. Berkeley-area assisted living communities must adhere to the comprehensive set of state laws and regulations that all assisted living communities in California are required to follow. Visit our Assisted Living in California page for more information about these laws.